There are fewer and fewer days ice cover on Lake Minnetonka each winter. Long-term trends show that ice cover begins later and ice-off is earlier. This means fewer days per season of ice cover. These same trends are occurring on lakes throughout the northern latitudes. According to one study which has investigated long-term trends (greater than 100 years) in ice cover, ice-on dates are later by about six days per hundred years and ice-off dates are between six and seven days earlier per hundred years. This means ice cover is almost two weeks less than it was one hundred years ago. The trends are continuing. Most scientists, including me, attribute this to climate change, which has resulted in warmer temperatures in the northern latitudes. For Lake Minnetonka, this means (on average) losing more than a day of ice cover each decade. In fact, in 21 of the past 30 years, Lake Minnetonka’s ice-off dates have been earlier than the long-term average ice-off date (April 15). While longer periods of open water may be a blessing for those who enjoy summer boating activities, there are other worries to consider. University of Minnesota scientists point out that earlier ice-off dates may disrupt fish spawning and make fish, such as walleye, less successful in recruiting young fish. As well, because more open water periods also means warmer water, many cold-water fish species may be displaced and replaced with warmer water species. These changes of course do not happen rapidly, but as these trends continue, we expect the fisheries in our lakes to be altered. Longer ice-free periods and warmer waters also give aquatic invasive species (AIS) and edge over native plants and animals. This is a concern because AIS already have an advantage over native species – that is why they are invasive in the first place. This means they are getting help becoming even more invasive. In addition, longer ice-free periods provide more time for AIS to move about on boats and trailers each year. Yikes - our task of keeping AIS out, minimizing their effects and mitigating their impacts gets more and more difficult. 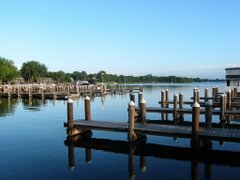 Enjoy winter activities on Lake Minnetonka – Spring will be here all too soon.